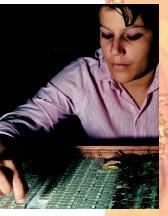 Entomologists study insects and their relatives and use their findings to help people, animals, and plants. Of the many branches of entomology, one of the most interesting is that related to forensics . Forensic entomologists help to solve crimes by identifying insects and insect remains at crime scenes. For example, some flies are found only in specific times and places. The police can use such information to determine where and when a crime occurred. Other entomologists study insects that spread diseases in people. For example, malaria, an infectious disease that affects more people than any other, is spread by a mosquito. Entomologists' specialized knowledge has helped to trace the spread of West Nile virus and Lyme disease in North America. Entomologists specializing in nervous systems test new brain drugs on cockroaches. Since their nerves work very similarly to those in humans, one can tell if a drug has potential to work on illnesses such as Parkinson's disease. Other entomologists use the existence of specific types of aquatic insects as indicators of water pollution. Many entomologists work in agriculture, helping prevent crop damage while minimizing the amount of pesticide used. An entomologist sorts an insect collection from Guanacaste, Costa Rica, for the Institute for Biodiversity, which plans to inventory all living things in Costa Rica. federal and state governments. Entomologists also work in sales and insecticide application. Usually an additional certification is needed for the latter. If a student has done well academically while working for the bachelor's, then he or she may start work on the doctor of philosphy (Ph.D.) at any of a number of excellent universities worldwide. With this degree, the entomologist can get jobs as a director of research program or in college teaching. Romoser, William S., and John G. Stoffolano, Jr. The Science of Entomology, 4th ed. Boston: WCB/McGraw-Hill, 1998.